It's not that often that I get swayed by the masses for the icon post and even now, sat here typing, part of my brain is screaming, 'Mini isn't even a brand,' but so many tweeters and facebook friends suggested the Mini that it was hard to ignore. I guess there's an argument that the Mini has got so famous that it has become a brand all of it's own. Sort of. Even if it is made by BMW. Mini's are cool. That much I can't deny. I'm not gonna go on about when they first came out (1959), or all the different incarnations that there have been and for once there's no real personal attachment. I've never owned one, although there's a big part of me that wishes I had. But back to the 'brand' thing. How does a car made by a British firm become a brand in it's own right? I guess quite a few cars do. It's all about where they sit in the social conscience. Ford is a great brand but equally there are brands within that brand. Capris for example conjure up an image of their owners as do Escorts. I'm not sure you'd say the same about a Ford Sierra. 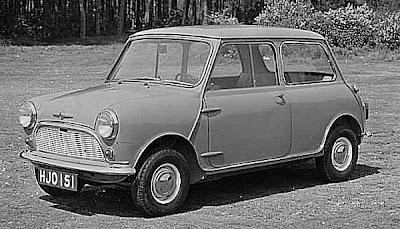 The Mini, which re-emerged in 2001 under new ownership, continues to achieve the same thing even if the owner you have in your mind has changed. The original was owned by the driver on a budget, it was a great, affordable first car for many people and I'm sure that many of those you still see on the road have student owners. The new one, for me anyway, is a girls car. It's pretty, whilst still maintaining the same basic shape but the design is softer and more expensive looking. Stick a Union Jack on the top by all means, but this is still a car for girls. That's not a bad thing by the way, it's a car that looks like it has a personality, and BMW have been incredibly shrewd in their marketing, trying to bring the vehicle to life. Tonight's post is dedicated to (from twitter) @twosoups, @RickHarwood, @dumbwittness, @whitespider1066, @EmmaBunce, @lmlc, (and from facebook) Martin H, Anakin, Mini (yes, really) and Nicky. Not one shout for Lamborghini? You fricking heathens.